We want to make the most of your dance photography session. The more you can practice before our time together, the faster we can get each each image 100%. This will give you a much broader portfolio of images in the end. When I photograph dance, I coach my dancers through similar situations. In the last article we talked about body position and the flattening action of the camera. Today we’ll go through everything happening on your face, which is super easy to neglect when you’re working through a perfect position or piece of movement. 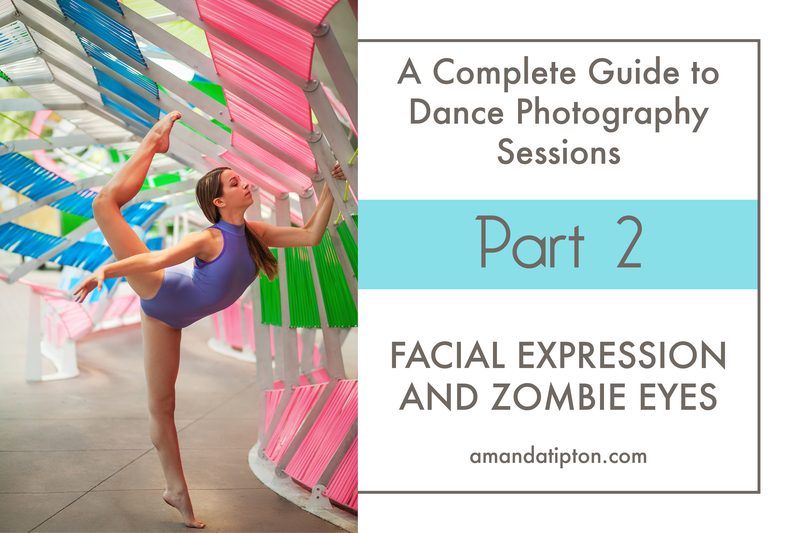 This is an area where dance training and dance photography collide. Dancers are taught to look up out into the house, to present to the whole audience. But at a session you have an audience of one- my camera. If you look with your eyes too far up, right or left into the imaginary house in the world around you, all my camera will see is the whites of your eyes. This gives you the dreaded “zombie eyes.” Try to look away from the camera a little closer to me. Gazing over my shoulders is a good reference point. Alternatively, you can look “down with your lashes.” Look down with your eyes, not with your chin, and don’t squeeze your eyes shut. Just look down towards the ground. While you’re looking down towards that ground, check your feet. I call this “thinking face” versus “performance face.” It’s so easy to get wrapped up in these tiny little details that you lose the actual performance of the moment. Just like onstage, at some point you have to let go, trust your body, and give it your all. The nice thing about a photo session is that if something goes wrong we can do it again. And again. And again. There’s no reason to get stressed about doing it again- stressed face is worse than thinking face. “One more time” is a feature, a perk, of a photo session- not a problem. How often do you get to do it again immediately on stage if something goes sideways? It’s okay to have fun and enjoy yourself too! What a fabulous series. I am in love with that shot of the dancer in the cloche hat! Those thoughts about eyes can really be used anywhere! This is awesome. So much amazing advice!! Perfect job of incorporating instruction and eduction with photos and examples. Great job! What a cool post! And so helpful in getting a glimpse into a dancers life/performance. Well done!